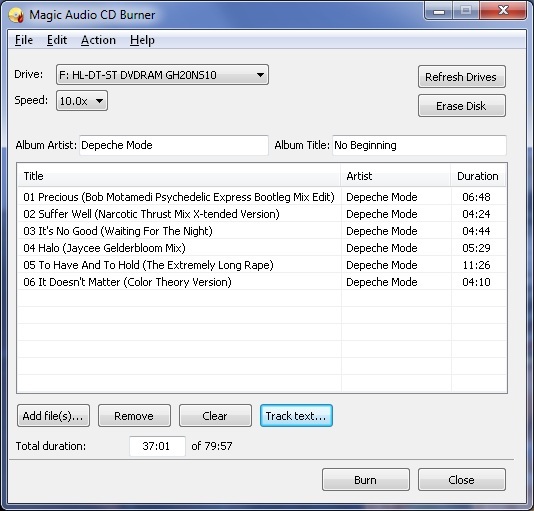 Magic Audio CD Burner is a freeware burning solution for burning MP3, WAV, OGG, AIFF files as CD audio that could be played on car CD player, CD discman, and so on. It allows you to burn aac to CD,ac3 to CD,aiff to CD,ape to CD,flac to CD,m4a to CD,m4b to CD,m4r to CD,mac to CD,mp+ to CD,mp1 to CD,mp2 to CD,mp3 to CD,mp4 to CD,mpc to CD,mpp to CD,ofr to CD,ofs to CD,ogg to CD,spx to CD,tta to CD,wav to CD,wma to CD,wv to CD,3gp to CD,3g2 to CD. 4Media DVD Creator for Mac can easily and speedily convert and burn AVI, MPEG, DivX, WMV, XviD, DV, M4V, 3GP, H.264/AVC, etc. to DVD movie disc, DVD folder or ISO file to DVD on Mac, and also burn DVD folder and ISO file to DVD disc. Magic DVD Creator is a professional and easy-in -use application that create your favorite DVD filess directly. With it, you may transcodes and burns any most used video files into DVD disc. Xilisoft DivX to DVD Converter provides the fastest and easiest way to convert DivX/XviD video files to DVD disc, DVD folder or ISO file. This DivX to DVD burner supports different DVD disc formats and allows you to customize DVD movie.